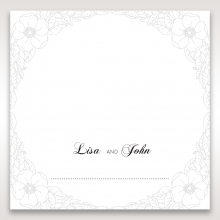 This soft white floral theme is laser cut and embossed with lovely forget-me-not blooms and leaves. 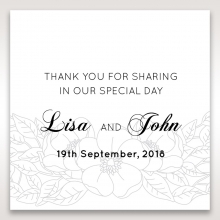 Your name and that of your fiancee are stamped at the bottom, and when your guests open the card, they will see your wedding details inside. 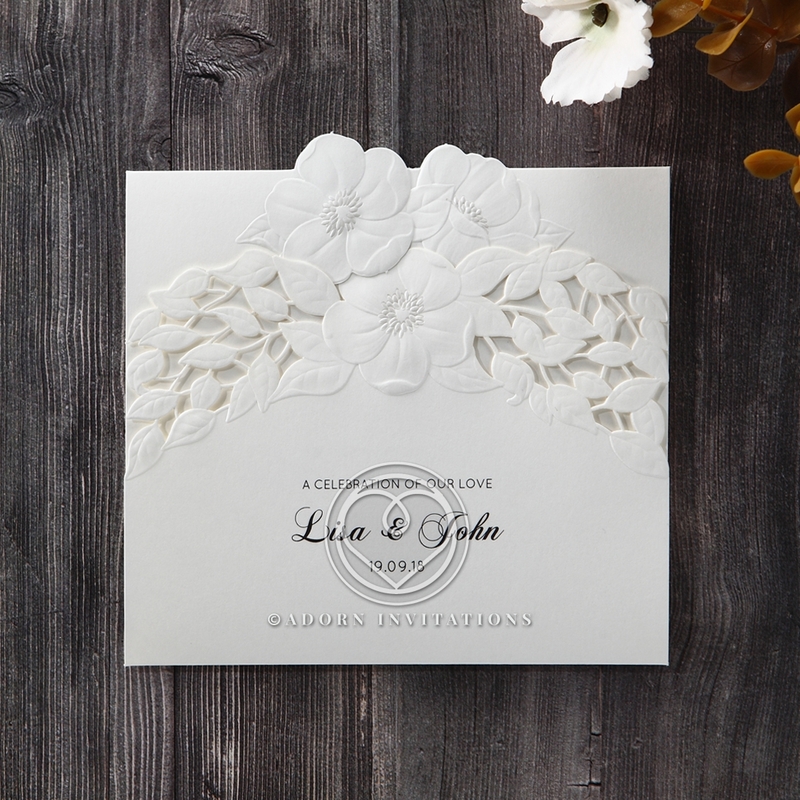 The high-quality cardstock we use means that the intricate laser cut and embossed details of the card truly leave their mark. 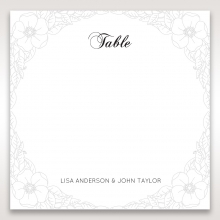 This invitation is perfect for your floral theme or garden wedding, and works well with either a casual Spring or Summertime wedding. 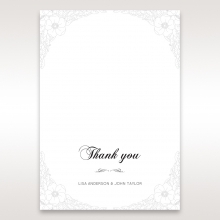 When combined with special order envelopes with a silver lining, they are even more striking. Loved the sample. They are exactly what I was looking for. As such, I ordered by wedding invitations. I was very happy with the samples. I showed by family and they fell in love too. 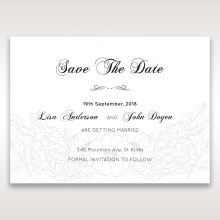 My sister is getting married and is check the site out for her wedding invitations. 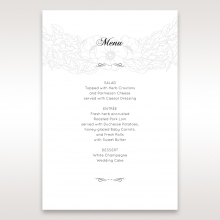 The design was exactly as pictured in on the site and of high quality. 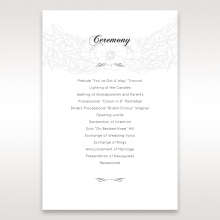 I can't wait to send these invitations to my friends and family. Love my invitation it’s even more beautiful in person. 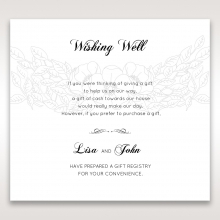 My guests love the invitation. I was concerned about receiving them on time but I received them sooner than I expected. I also communicate with customer service via chat which was very helpful. Very elegant, romantic and with such delicate details made this invitation the one for my brother’s wedding in South America. 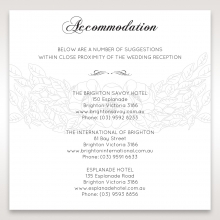 I did my wedding invitations with B wedding and everyone was amazed with such beautiful invitations, high quality. Definitely I will always stay with B wedding for special events in my family and it is highly recommended to my friends. 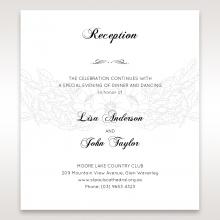 These invitations are so elegant and beautiful! I needed these to get here before Christmas and the production team was able to send them so promptly. They arrived by Dec 19th, less than a week after my finalization! I am so happy to have picked this design as well. 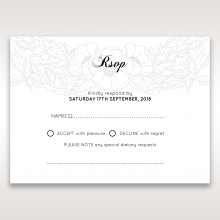 I love this invitation it is of very good quality. I am very impressed.